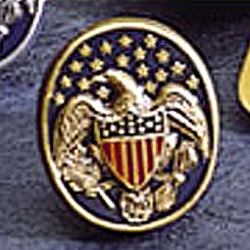 Gold Madison Glassware Tie Tack: The American bald eagle and shield is best gift for any occasion. The pewter item is antiqued with 24k gold electroplates. Gold Madison Glassware Tie Tack is based on a design on a pair of glass decanters. The gold jewelry design was given to President James Madison in 1816. These custom tie tacks were a favorite of Madison, the fourth President of the United States.